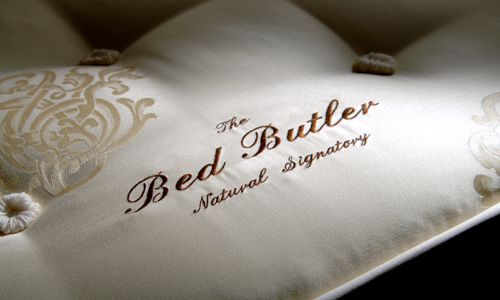 The Natural Signatory Divan bed only uses natural fibres in its construction. The divan is constructed using two layers of springs. A lower layer is made up using 600 heavy duty Calico pocketed springs with an upper layer of 1410 hand nested calico pocket springs giving exceedingly comfortable support to the mattress. This Spring combination is mounted onto a solid timber base. Incorporated into the base are two drawers , one each side of the bed, allowing access for storage linen etc. The divan base is overlaid with 1200 GSM of blended fleece wool and cotton and covered in the finest quality ticking and upholstery fabric. It is hand tufted with hand tied woollen tufts for added comfort. The headboard it is also covered in the same cream upholstery with modern features of upright panels. The divan base comes into sections which allows ease of moving up a staircase. These two bass sections are zipped together across the bed giving a secure base for supporting mattress. 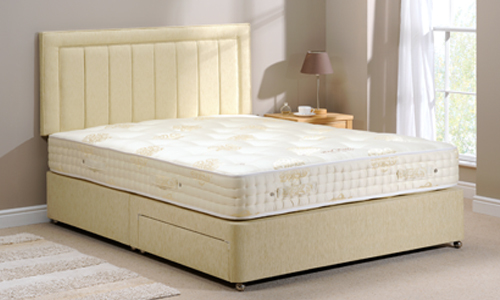 The natural signatory mattress is made with 1800 individual pocket springs. Each independent pocket spring is held in its own pocket for complete independent movement allowing the mattress to flex and mould to the shape of your body and provide the best support for your spine and therefore giving perfect comfort. A layer of latex with a thickness of 3.33 cm gives the mattress exceptional response to a person's body weight. Together with the pocket springs, the latex moulds to a person's body shape giving support and comfort to a luxurious degree. The latex has the ability to help maintain correct spinal alignment making ideal for a healthy night's sleep. A layer of Chinese horse hair to a weight of 1500 g per panel is used to give extra comfort and protection between the pocket springs and a softer tufting materials. Horsehair has long been used in mattresses making for its incredible springiness. A final layer of 900 g per panel of needled cashmere is used as it is one of the softest fibres available. The loft and soft spring provided by cashmere gives the mattress and added a mention in comfort. Kashmir is the ultimate in luxury natural fibres. Like all, cashmere as inherent properties of ventilation and installation but because of the quality of cashmere fibres it makes the mattress much more sumptuous.